Writing about a city’s first settlers is not as straight forward as it may seem and as an historical society, it is important to be accurate. But when a city’s boundaries change over the years, how do you refer to a settler’s residency? For example, Lawrence Hall’s DLC (donation land claim) was up near Walker Rd. While this area is currently within the Beaverton city limits, back in 1847 it was not. In fact, there was no city. There was no Beaverton. It was often described as just a bunch of ponds connected by beaver dams. Beaverton however did become a city in 1893 and over the ensuing decades, it grew steadily and continues to grow today. Many settlers who’s DLCs were miles away from the heart of the city limits in the early 1900s are now within the current city boundaries. I think it therefore appropriate to distinguish the words “city” and “community”. So while we at the society may interchange these words on a regular basis, it should be noted that it is because of the contributions of these early settlers to the greater Beaverton community, they we feel that it would be accurate to also consider them as part of the history of the City of Beaverton, OR. 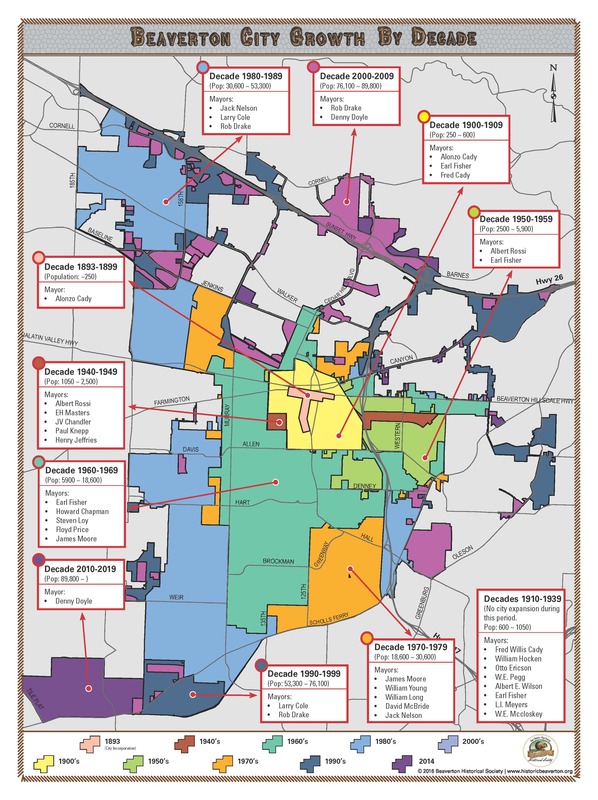 Below is a map of how the City of Beaverton grew thoughout the years. For a printable PDF version of this map, please email us.